As a contemporary alternative to standard deep or “3- D” frames for objects, I would like to introduce to you our latest innovation, acrylic domed fronted frames. We can have these made to any depth or size in 3mm or 5mm thick acrylic to suit the task. These fronts have rounded corners to the sides with no joins and are only joined at the top and bottom edges. This allows the object to be seen from above, below and from either side and is a lot more light and airy in comparison to traditional deep frames. These fronts not only offer protection from dust and tampering, but offer 90% UV protection too. The domed front is 120mm x 340mm x 65mm and a guide price would be £25.00 plus the cost of the frame. We have reframed these cars (they were for shop display) and you can see how we framed them previously here and decide which you prefer? The domed front is 335mm x 240mm x 90mm and a guide price would be £34.00 plus the cost of the frame. 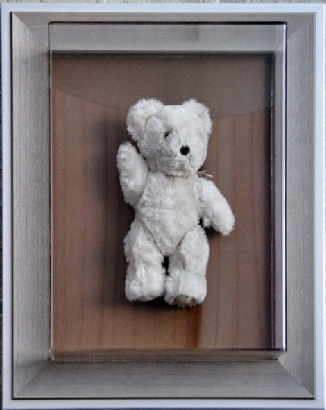 We have reframed this teddy bear (it was for for shop display) and you can see how we framed him previously here and decide which you prefer? 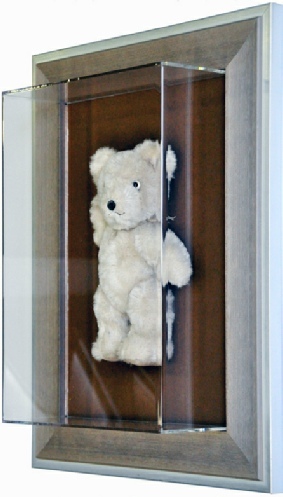 We also offer a comprehensive range of display cabinets and domes which can accommodate all manner of models, dolls, watches, sporting memorabilia such as bats, balls, hats, helmets, gloves, boots etc. Please call the workshop with your requirements for suggestions and prices.